Let us be your escape goat. Today, we play in the Catskill Mountains! Today, your legs are breaking trail for a greatest-of-all-time spring vacation! Today, we dive into the deep end for a greatest-of-all-time getaway at a Catskills family resort! Spring in the Great Northern Catskills brings a new season of opportunities to experience a greatest-of-all-time adventure. From hiking and camping to unique culinary experiences – let the Catskills be your escape for an epic spring getaway. 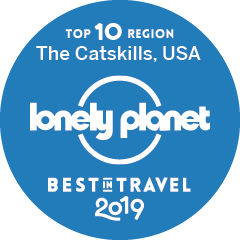 The Great Northern Catskills is filled with unique lodging that offers food and rooms that are second to none. Plan your next Catskills getaway as an all-in-one experience. Explore lodging and dining packages that will take your next vacation to Greatest-Of-All-Time levels. The Catskills are home to a rich performing arts scene. From the performance that entices with the visual spice of a market in Tangier, to the music of the Emerald Isle, explore the stories that resonate, the tales that inspire, and the music that moves and shapes each new generation. Discover the best of the Great Northern Catskills. Explore craft breweries, unique lodging options, scenic hiking trails, and more.